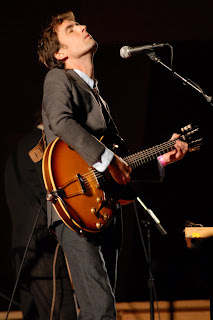 Here’s what I told Popmatters that Andrew Bird did to the kids at the Priztker Pavilion last week; and Colleen did a nice job of capturing the culprit as she always does. A lesson learned from kids that know how to rock to Andrew Bird. The rush of kids toward the stage was fantastic! It came near the end of Andrew Bird’s Chicago show. And as I watched the youngsters sprint from all areas of the venue and down the aisles toward the stage of the Pritzker Pavilion, I was reacquainted with a sense of innocence that I’ve either been missing, avoiding or choosing to forget about when enjoying a live show. Those kids did what is often harder to do as you get older, which is not suppress that freely unashamed and spontaneous expression of joy when something is so exciting and you’re being yanked by your heart and mind to move outside of the normal mold of what’s “okay” to do in public, especially at a concert where there are more seats than open standing space near the stage. And for some reason I don’t fully understand yet, we push this spontaneous urge down, bottle it up and sometimes even thrown it away as we get older, deeming it immature or unacceptable. But it was so fun to watch those kids run down the aisles and jump around up like miniature pogo sticks to Bird’s operatically rocking “Fake Palindromes”. I saw a few older folks shaking a leg, and yes, after the second chorus came around the whole crowd was on its feet, but it was those kids that started all the blissful ruckus. So who were these kids? I don’t know for sure, but I’m guessing they were probably related to the fundraiser for the night as a block of tickets for a Meet and Greet were being auctioned off benefiting local non-profit Rock for Kids.